An interesting study looked at similarities and differences in the effects of two medications that have anti-depressant effects and yet are extremely different in terms of how they work: ketamine and imipramine (a tricyclic antidepressant). This industry supported study looked at the effects of these two agents on a reward circuit (involving the prefrontal cortex (PFC), nucleus accumbens, hippocampus, and amygdala – see picture on the right) in the brain. 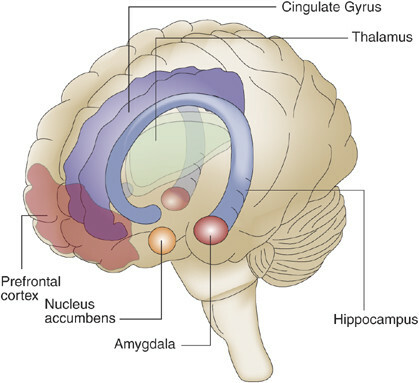 This circuit has been shown to be activated in substance use, and one theory about what causes substance use is the “hijacking” of these circuits so that they respond preferentially to ingestion of the triggering substance and do not respond to environmental cues and rewards. The circuits have been shown to be deactivated in depression – and this deactivation is linked to the loss of pleasure (anhedonia) and motivation associated with depressed mood. The study looked at two groups of mice, one group was found to be susceptible to social defeat stress (SDS) and the other was not. The group that was susceptible withdrew from social interaction after being exposed to a “bullying” interaction with a dominant mouse. This is an animal model of depression that has been well studied. In the susceptible group of animals, both acute ketamine infusion and chronic treatment with imipramine significantly reduced social avoidance after exposure to threat from the dominant animal in about half of the animals. Thus, about half of the animals had an “antidepressant” response to treatment and the other half did not. This allowed the researchers to identify differentially expressed genes (DEGs) in the reward circuits – genes that were either activated or inactivated more depending on whether or not the mouse was a responder to the infusion. The pattern of gene activation associated with response to imipramine was different than the pattern of gene activation seen in those animals who responded to ketamine. As you can see in the figure below, these differences were quite significant. Different patterns of gene activation associated with response to ketamine or imipramine. Imipramine response was associated with gene activation in the nucleus accumbens and amygdala. Ketamine response was associated with gene activation in the hippocampus. Response to treatment was associated with a similar pattern of gene activation in the prefrontal cortex in both ketamine and imipramine infused animals, whereas there were different patterns of activation in the nucleus accumbens, amygdala and hippocampus in responders to ketamine versus responders to imipramine. Also, overlap in gene activation in the prefrontal cortex between treatment responders to ketamine and resilient animals was greatest in the prefrontal cortex. And the same finding was seen with imipramine responders – the greatest similarities between imipramine responders and resilient animals occurred in the prefrontal cortex. These results might be compatible with two different mechanisms of action for antidepressant medications – one involving the hippocampus and glutametergic neurons associated with memory encoding which is associated with ketamine response and one involving the nucleus accumbens and amygdala associated with imipramine response. Both of these pathways may have similar downstream effects on the prefrontal cortex (associated with planning and cognition in humans). Equally important, nonresponse is associated with another pattern of gene expression that may be a target for alternative treatments. Beta Catenin and Depression – resilience to depression may be associated with differential beta catenin activity in the nucleus accumbens. New Antidepressant Stimulates Neuron Growth – a new medication (NSI-189) which has been shown to increase the production of cells in the hippocampus and the amygdala in preclinical studies may help treat major depression.